Henna is a plant (Lawsonia Inermis) that grows in hot, dry areas. The leaves are harvested, dried and ground into a powder. I mix this powder with lemon juice, tea, sugar and essential oils to create a paste. The paste is applied to the skin in decorative designs and leaves behind a natural stain that can last anywhere from 1 to 3 weeks. The process of using henna to dye skin has been around for thousands of years. Not at all! Since the paste simply sits on your skin, there’s no discomfort. Most people find the process soothing and fun. 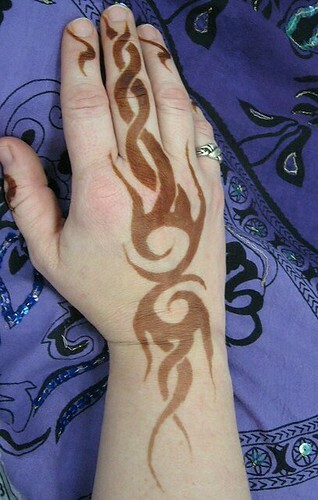 Natural henna only dyes in shades of brown. The exact shade will depend on your body chemistry, how long the paste is left on and how well you take care of the design. (Any pictures on my site that *look* black have been photographed with the paste still on the skin.) Anything that is advertised as “colored” or “black” henna is not henna at all! Be especially careful of “black henna” – it often contains a dangerous black dye called para-phenylendiamine (or PPD). PPD should NOT be used on skin. It can cause severe allergic reactions, chemical burns and permanent scarring. Don’t take chances with your health! What kind of designs can you do? Anything you can think of! I’m comfortable with many of the traditional styles – Indian, Arabic, Gulf or Moroccan. But I can also do tattoo-style or tribal designs. I can do complex bridal designs or simple hearts – whatever suits your needs! To suit the mood of your event, I can appear in traditional Indian clothing upon request – from a casual salwar kameez outfit to a formal sari. You can leave me a message in the comment area below. It will *NOT* appear on the website. It will just email me your message.